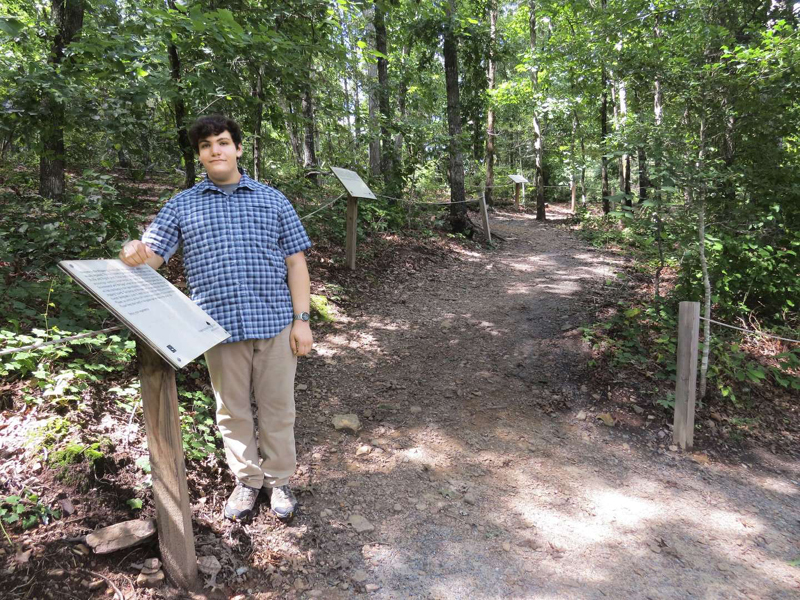 When he was a kid, Evan Barnard, now 19, learned that someone had damaged a Braille nature trail. People who are blind or have low vision use these trails to explore nature. Barnard helped fix the trail. Then he created a new one. He spoke about his efforts with TFK’s Kio Herrera. 1. What is a Braille nature trail? A Braille nature trail is a footpath that has guide ropes and Braille signs. There are spots along the trail where visitors can touch scratchy tree bark, listen to birds, or smell flowers. 2. You designed and built Whispering Woods, a trail in Buford, Georgia. Tell us about it. It took about two years to complete the trail. The most important part was having members of the blind community test it. I wanted to include the people that would benefit from it the most. 3. What do visitors think of Whispering Woods? Being outdoors can be unfamiliar for many of them. I remember one student who was nervous during my guided nature walk. Once it was over, he wanted to do it again. It is a transformative experience for many of our visitors. 4. Why do you think it is important for people with low vision to experience nature? Experiencing nature is important for everyone. The trail allows people with low vision to be outdoors and independent. 5. What is the biggest challenge in making nature accessible to everyone? Braille trails and other outdoor opportunities exist all over the world. But most people are not aware of them. I created an online list to help solve this problem. Now people can find trails close to where they live. 6. What is the biggest lesson you have learned from the visually impaired community? They have taught me so much about overcoming obstacles and appreciating the world around us. 7. You were a youth delegate for the United Nations because of your work. What was that like? It was very powerful. I got to meet hundreds of people. I would definitely recommend finding people from all types of communities to share your ideas with. 8. Do you have any advice for kids who want to make their community more accessible? You don’t have to start your own organization to make a difference. Get to know your neighbors. Figure out what they need, and let them be part of your project.